Helen Duffy regularly publishes on international law and practice. A full list of publications can be found here. An overview of her most recent publications is available below. STrategic Human Rights Litigation: Understanding and Maximising Impact. Helen Duffy Recently published a Strategic Human Rights Litigation: Understanding and Maximising Impact. 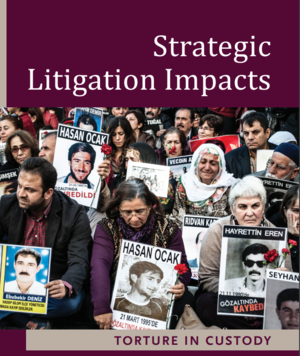 It critically appraises the purpose and impact of the burgeoning practice of strategic human rights litigation internationally, including from the victims perspective and as regards its contribution to broader strategic social, legal or institutional change. The study is aimed at providing a targeted resource to those seeking to use litigation as a human rights tool and to contribute to debate on how to litigate more effectively. The book was written with the support of the Nuhanovic Foudation, University of Amsterdam, and was published in September 2018. The 'War on Terror' and the Framework of International Law (CUP, 2nd ed 2015) was published in April 2015 (1st ed 2005). The book is available via the CUP website, here. The Open Society Justice Initiative has conducted an important series of detailed case studies that examine the impact of litigation in particular thematic areas and specific states. Helen Duffy is the Author and Lead Researcher on one such area, concerning the litigation of torture in Argentina, Turkey and Kenya. The report is available here. A research project for the OSCE focuses on how to address the threats and challenges of “foreign terrorist fighters” (FTFs) within a human rights framework. The report, authored by Helen Duffy, was launched at the 2018 Human Dimension Implementation Meeting (HDIM) in Warsaw and will is available here. Published in B. Goold and L. Lazarus, Security and Human Rights (Hart Bloomsbury Publishing, 2018), and available here, this chapter explores evolving practice in relation to the ever more expansive use of criminal law as a ‘preventative’ tool in countering terrorism. It considers in particular the nature and implications of proliferating international, regional and national legislative and prosecutorial practice in relation to ‘crimes of expression’ such as indirect incitement, glorification, provocation or justification, alongside international human rights law and basic principles of criminal law. How far can criminal law be stretched in the name of prevention before the connection between the individual and wrongful conduct is lost? At what point does criminal law reach too far back to preparatory or pre-crime stages, or too far out to sustaining environments, such that it falls foul of the flexible international legal framework within which it must operate and on which its legitimacy depends?